If you are traveling by air, car or train and bus with your pet. There are a few items very important to keep in mind. Traveling by air can be stressful for both the animal and you. The dog if small enough can ride under your seat, however if too large you will have to check the dog through in cargo. The first thing to do is check with your veterinarian for all shots and boosters you may need depending on where you will be traveling. Your veterinarian can also discuss any special requirements you may need to prepare for on you trip. Getting your dog ready. If your dog is not already used to being in a crate have them spend time in a crate. Praise your dog for staying in the crate. Take them for walks after spending the time in the crate. Take your dog for walks around people, children and noisy places. The pet owner will want to do this in short stretches of time is your dog becomes anxious around noise and activity. Remember your pet will be around lots of new noise and people while traveling. What to bring on the trip? Bring treats for your dog such as Grizzly treats that can be broken into small pieces. Try and stay away from treats with Peanut Butter as you maybe sitting next to a person on the flight with Peanut allergies. Most foods come in small sample sizes this will make traveling easier as you will not be searching for your dogs food when you arrive at your destination. Pumpkin will settle your dogs stomach and relief any gas issues. Have a way to give water to your pet. The Pet Topper screws on to a water bottle and is easy to carry. The dog just licks the top and water comes out. The other is Furry Traveler’s travel set it is great for traveling in a car or RV. It keeps the food and water all together. When packing bring along a favorite toy or toys and have a new one to entertain you dog and reward the dog. This also makes it fun for you to try out new toys. 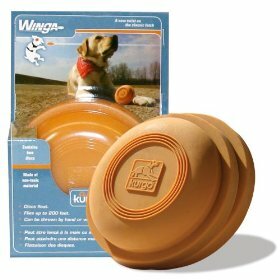 Are you going to a beach area bring along Kurgo’s Winga a frisbee for dogs. Want to have fun bring the Moody pets mustache. The loopy toys are good if your pet does not chew. If you have a heavy chewier bring Planet dog’s balls. You will also need the pee pads as now that you have fed and watered your dog they will have to relieve themselves. Hopefully you will be at an airport that has a pet station. The Denver airport has a designated spot for pets, Charlotte NC has large grassy areas to walk your pet check out the airports you will be passing through or arriving at. If you have any good tips or experience with airports leave the information here for others. When arriving at a hotel that you have checked for accepting pets. Inspect the room for unwanted visitors such as bedbugs and fleas. Unfortunately not all pet owners are as careful of their pet as you are. There are some good pesticide free Bed Bug killers and repellant out there to try. One is Bed Bug patrol it is made with Peppermint and clove oil among other items. It is pesticide free and has a light smell. It is safe to spray around the luggage and crate. When you leave the hotel/motel wash and dry all clothing and bedding in hot water and dry for at least 30 minutes. Bed Bugs have been making a comeback in all levels of hotels/motels and apartments. Praise your dog as much as possible.